Thanks to technological innovations, a person can work on a laptop computer from anywhere yet suitable furniture for this purpose is often lacking. Die-cast aluminium, powder-coated textured finish. NesTable offers a lightweight and flexible solution. 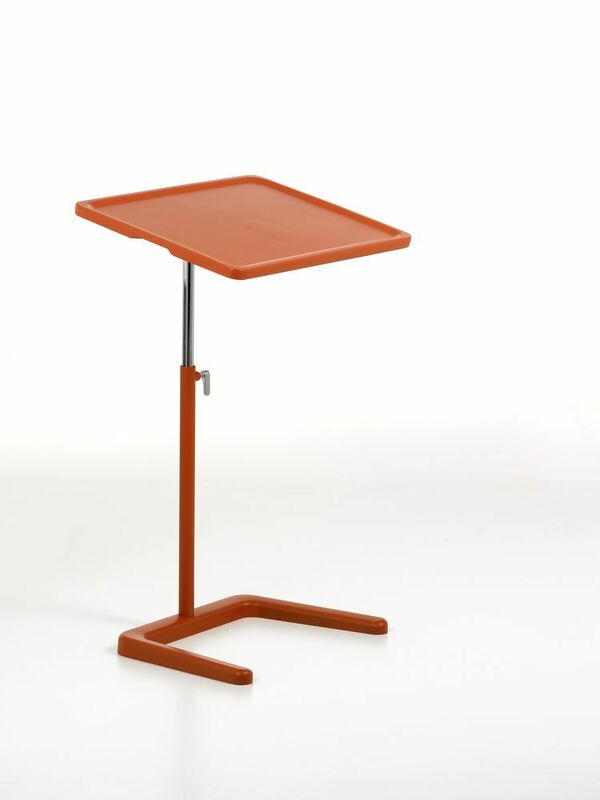 The tray platform is fully adjustable in height and angle, which makes it possible to maintain a correct ergonomic working posture, even while working from a sofa or lounge chair. Known for thinking outside the box, Jasper Morrison is one of the most successful industrial designers of the past few decades. Together with his colleague Naoto Fukasawa, he defined the term 'super normal', which in his opinion answers the question of what 'good design' should really be. In his work, he strives to create good examples of understated, useful and responsible design. Morrison has developed several projects in collaboration with Vitra, including the Basel Chair, the Place Sofa and the HAL chair family. His designs are represented in New York's Museum of Modern Art and other prominent museum collections around the world.